If you are still having spring rain and possibly even snow thrown at you, I’m sorry, I don’t mean to rub it in. 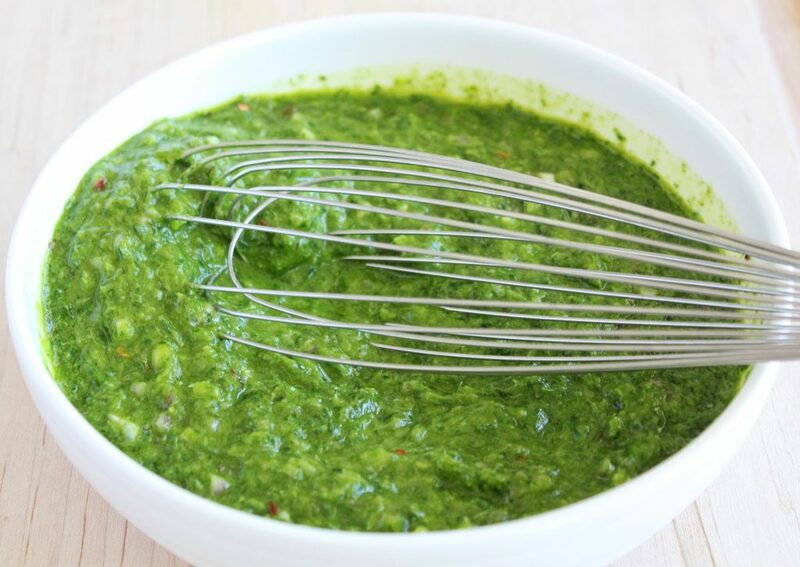 This chimichurri sauce will help things around your place taste a bit more like spring though, I promise. 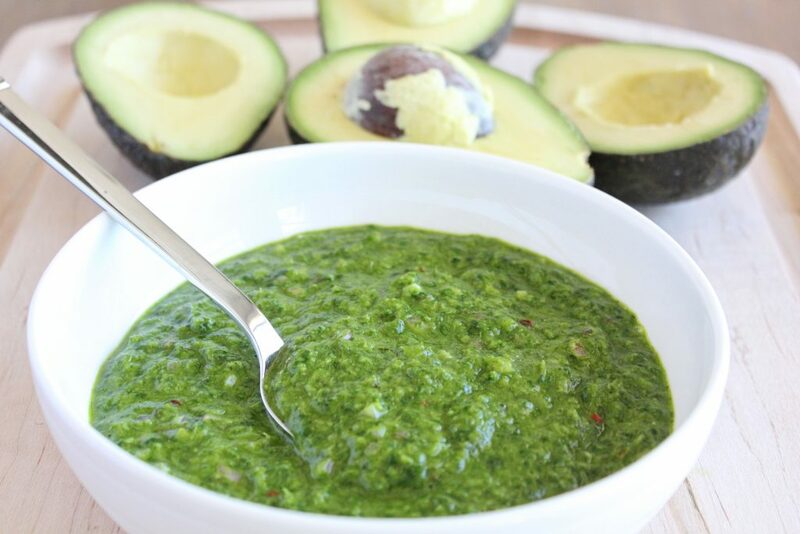 Chimichurri is a fun name for a sauce that is as easy to make as pesto. It comes from Argentina, the land of beef, so it seems a little bit strange how deliciously well this sauce translates to veggie dishes too. 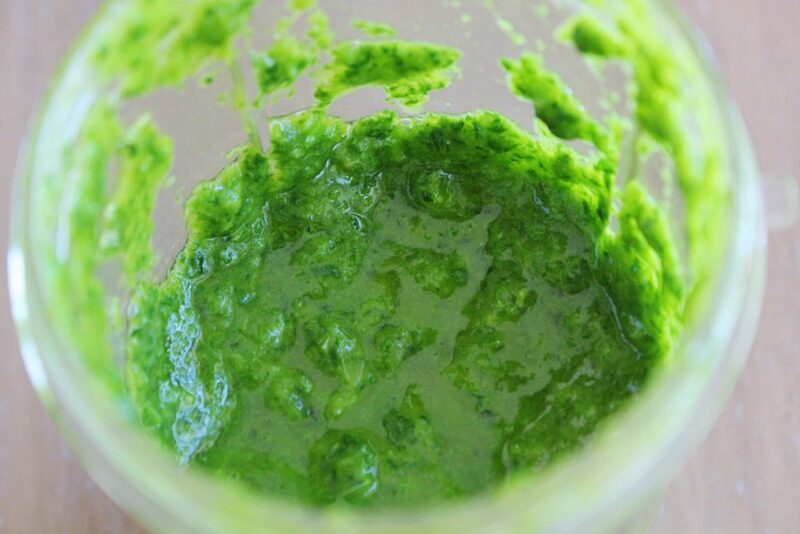 It’s herby and fresh (just the way spring should taste) made with lots of parsley, cilantro and oregano (I used dried oregano but you could also use fresh). 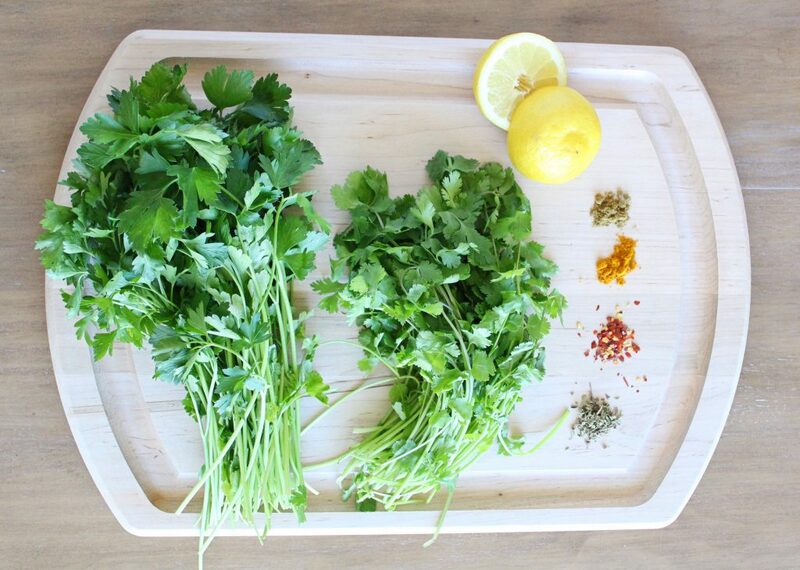 These fresh herbs bring lots of chlorophyll as well as diuretic skills and protection/detox help from radiation (this obviously applies to cancer treatment but we are all exposed to small amounts of radiation every day, so it actually applies to all of us). Oregano is immune boosting and antifungal, as is the fresh garlic, which is also great for lung health. The spices all bring their own health benefits including big anti-inflammatory powers and the lemon juice brings it all to life with some tart vitamin c. I added some chili flakes because my husband needs them to feel like it’s a meal (for real), but feel free to leave them out if you’re sensitive to spice or nightshades. 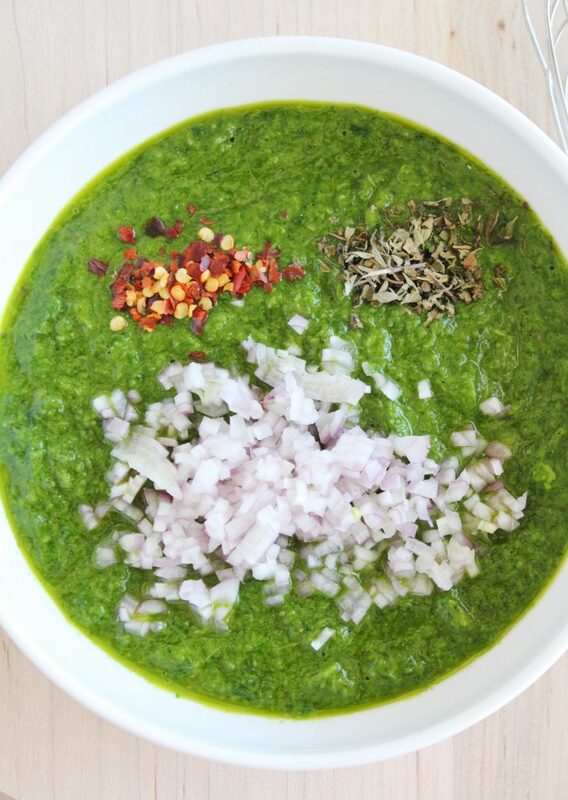 Here is the fun part; traditionally served with grilled beef, there is so much more you can do with this sauce. For the photos, I have served it very simply with fat wedges of perfect avocado. I sort of wanted to show you that it was a party in itself and you don’t need to serve it with too much to make a great-tasting dish. However! You can also get pretty fancy by adding some fresh grapefruit (or mangoes!) to the avos, or lay down some arugula and top it with tomato slices and drizzle this on top. Not feeling as summery as I am? 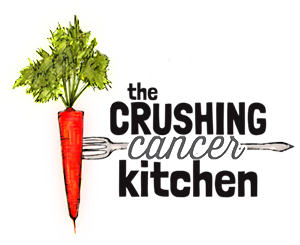 Drizzle it over some roasted beets or some massaged kale with grated carrots and beets. Or roast some eggplant, chickpeas and mushrooms and toss them with chimichurri as they come out of the oven. Add a scoop to a basic salad dressing, or add it to the mixture of your fave Veggie Burger, Plant-based Cream Cheese, Eggplant Mayo or Hummus recipe to add a sassy green edge. 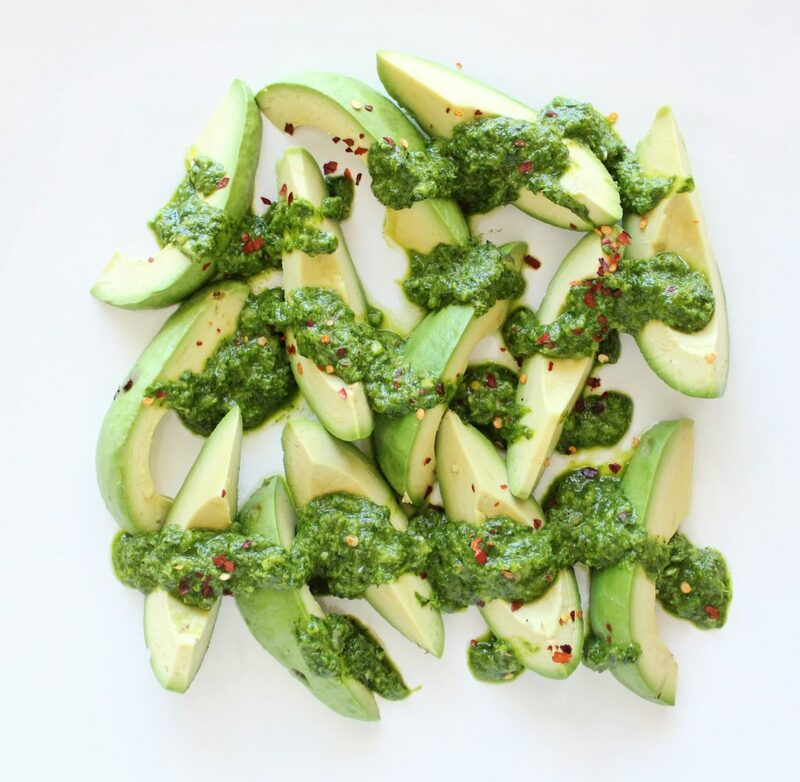 You can even mash it up with avocado to make a unique and easy guacamole. It dances well with practically everyone. It keeps for a few days in the fridge and a bit longer if you keep it well covered under a layer of olive oil. It also freezes very well, so freeze what you won’t be using right away. 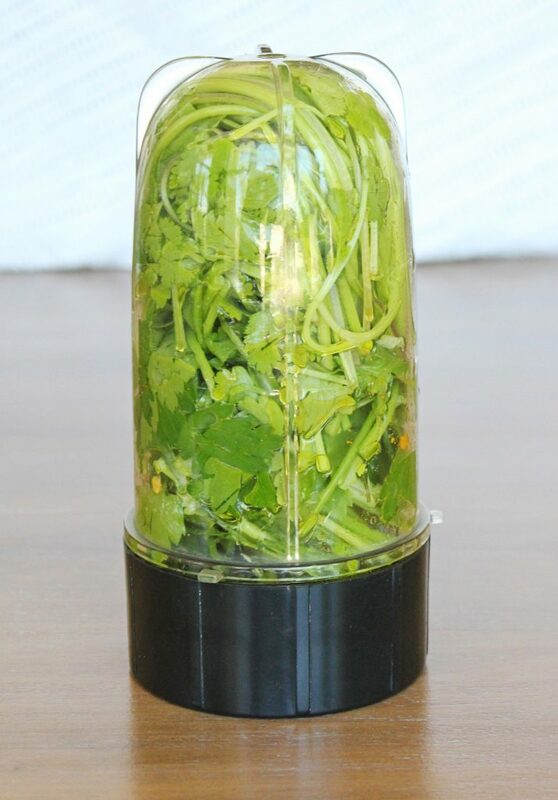 In a blender, blend the parsley, cilantro, turmeric, pepper, cumin, garlic, olive oil and lemon juice/zest until smooth (add a bit more oil if it needs more to get your blender going). Stir in the diced shallot, oregano and chili flakes (it's not a big deal if it all goes in the blender, but I find that stirring in those final ingredients makes them less overwhelming). 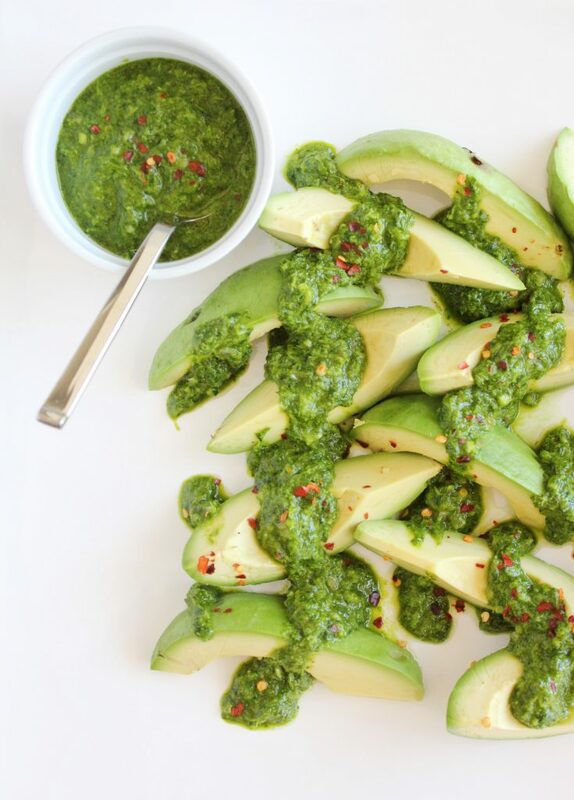 Serve on fresh avocado wedges (or literally anything that you love). Awesome!!! I’m glad you both loved it, I’m so happy to hear it. 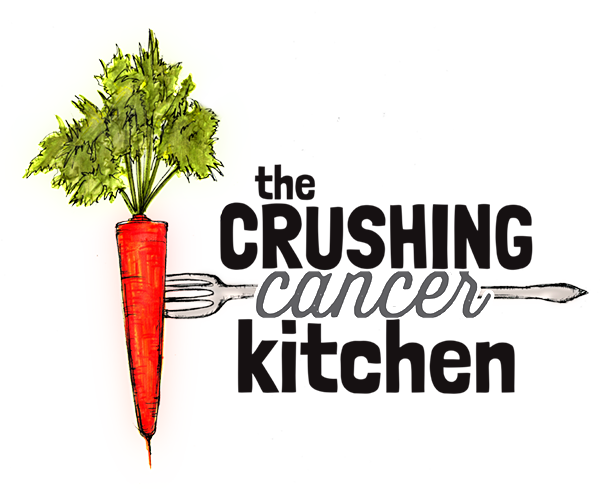 And I hope some of it made it onto your veggies too! This sauce is DELICIOUS! I decided to take the easy route and threw everything in the blender. Had to add water (I have only a single-serve blender, it needs liquids), but the sauce still came out the thickness of my smoothies, and I started eating it with a spoon it was so good. My husband came over to check, and he ate a spoonful so I had to get the rest out of sight so we can have it over veggies tonight. Also thank you so much for the black pepper tip – I’ll start adding black pepper to my turmeric mixes. i like “put most everything in a blender, and at the end stir in the rest.” That’s a recipe I can do. I will definitely be checking out your other recipes. The photos are stunning! And the chimichuri looks remarkable. I haven’t had any for years and I’ve never made my own. I love your recipe. Are you in California? Send photos. Love to all three of you.